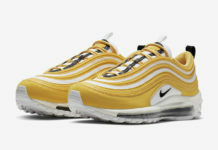 Adding to Nike’s “Metallic” Pack, the Swoosh is set to release another Air Max 97 in Metallic Silver and Metallic Gold. This iteration of the Nike Air Max 97 features Metallic Gold on the mesh area, while Metallic Silver covers the leather overlay portion. University Red adds for a nice contrast with Black detailing on the midsole, tongues, inner liner, pull tabs, and rubber outsole. Reflective detailing completes the design. You can already find these available at select overseas retailers like LifestyleSports, followed by a wider release in the states to come very soon on Nike.com.